Ahlan Arabia Tours welcomes you to our Twilight Cruise. 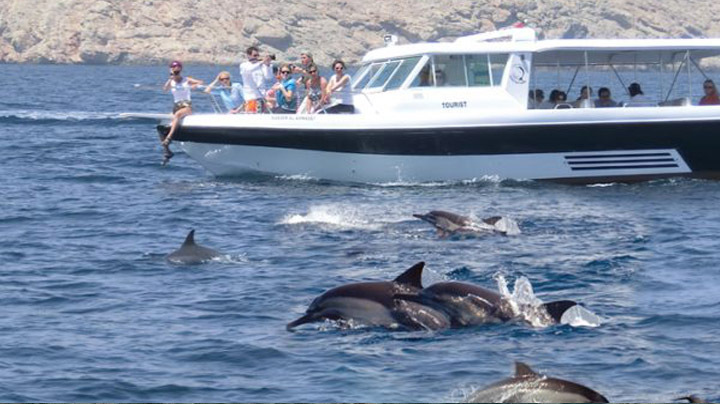 This is a 2 hours trip on Omani Traditional dhow, Offers many exiting and exotic sights and experiences. Enjoy the scenic beauty of Oman coastline over the pristine waters of Oman’s capital area, breathtaking views of some of its land marks. The Dhow enter the natural harbor of Muscat, Royal palace Qasr Al Alam And 16th century Portuguese forts of Al Mirani and Al Jalali. The Dhow Sail then follow the Coast and experience the breathtaking views of Al Bustan Palace Hotel, Qantab fishing village. The highlight of the twilight cruise is the Sunset that one can enjoy from the deck of traditional Omani dhow. Transfers from the hotels/Light refreshments, Omani coffee and dates. Minimum passenger : 10 nos.